Unfortunately, the current version of the MacBook Pro appears to only support 1.5Gbps SATA. I’m not sure whether this is an OS, drive or hardware problem, but your drive is limited to transfer rates of 150MB/s. For most laptop drives, this isn’t a problem. Your 5400RPM SATA drive just isn’t going to be moving anything at 150MB/s. The real problem lies with high performance SSDs. You’ll see four categories of performance: random read, random write, sequential read and sequential write speed. All four categories matter to the performance of your hard drive but some are more noticeable than others depending on what you do. Random read/write performance actually contributes to your system feeling fast more than anything else. These are the sorts of transactions that happen when you’re launching applications or searching for files. Sequential read/write transactions happen when you’re copying large files to/from your drive. The latter is less common than the former for most users but that’s why you don’t see the 1.5Gbps issue really impacting real world performance on the new MacBook Pro. All three of the SSDs in the table above would be interface limited on the new MBP because of their high sequential read speeds. If you were copying large files from the SSD in your MacBook to a similarly fast device, the transfers could take longer. I doubt the performance difference would be significant or noticeable in real world notebook usage, but it doesn’t change that there’s no reason to take a step backwards like that. In the coming years we’ll see more drives that can consistently break 150MB/s; Apple artificially limiting performance today would just hinder progress. 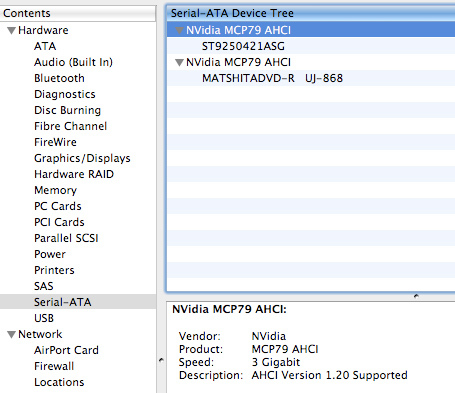 I’m not sure what the issue is since the 9400M does support 3Gbps SATA. Perhaps it could be one of the mystery optimizations Apple did to increase battery life well beyond reasonable expectations? Or perhaps it’s just an issue with the firmware and something that will be corrected in the near future. It's worth noting that the version of OS X 10.5.7 that ships with the new MacBook Pro is a different build than the one everyone else gets to download. It’s something to keep an eye on and I’ve already sent out some probes trying to gather more on the issue. Windows 7 should be better in terms of Battery Performance actually. They rewrote the kernel and scheduler for Windows 7 to let the CPU reach deeper sleep states which was impossible due to interrupts occurring every 8 ms or so. hmm. I installed OSX on my laptop and OSX was 3hrs when it's 8hrs with vista. ...instead of their advertised 3.0gbps. Can you look into or at least call THEM out on that too, Anand? I am thinking that its a drivers issue on using windows on a mac and battery life. Do you honestly expect apple to let windows on their hardware get better batterylife then osx? I would think its a drivers issue and not how the OS is programmed. Win7 would do that only if Apple set up its drivers to do that. . .
i was just wondering if the tests for windows was done by booting on windows, or by using VMware fusion or parallels? if you're just emulating windows, will that have an effect on battery life? so it seems that by using windows, you'll have a higher power consumption? so is it safe to say, that the mac mini which was advertised to idle at 13W will have an increase in power consumption while running windows?